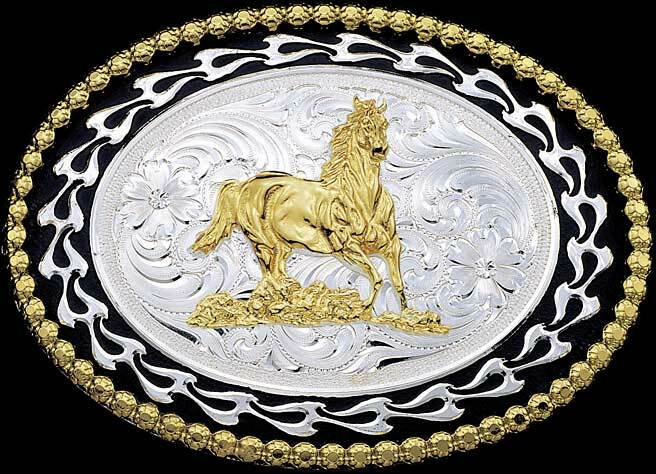 Gold Mountain Trading�s custom figure belt buckles by Montana Silversmiths offer a wide range of fine designs and personalization options. Add the figure of your choice to any one of our buckles. You can incorporate your own brand or logo, or choose a figure from our diverse catalog � 500 figures available. 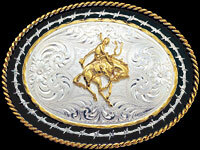 These high quality buckles are handmade in the USA by American craftspeople. And with our instant rebates you are always assured the best price. Montana Armor� products have a finish as tarnish-free as their outstanding reputation. Furthermore, most buckles can be made with an antique patina finish. For a full list of figures available, download our figures catalog. 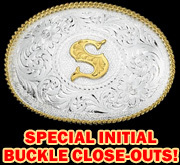 Also, take a look at our Custom Trophy Buckles section for additional fine buckle options. Please allow 4 - 6 weeks shipping for your buckle to be delivered. Add the figure of your choice (500 available), your brand or your logo to any of the quality Montana Silversmiths custom buckles shown here. Download our figures catalog ... or use your brand or logo. Montana Armor tarnish-free finish. With our INSTANT REBATES, you're assured of the best prices! Handmade by American craftspeople: Allow 4 - 6 weeks to ship. Most buckles can made with an antique patina finish. Also, take a look at our Custom Trophy Buckles. The Catalog of Figures here. 3 1/8" x 4 1/4"
2 5/8" x 3 5/8"
Shown with 758 - Cowgirl Up. Price includes up to 8 letters. Engraved letters on names of 5 letters or less. sizes and are not engraved. Display your choice of figures.